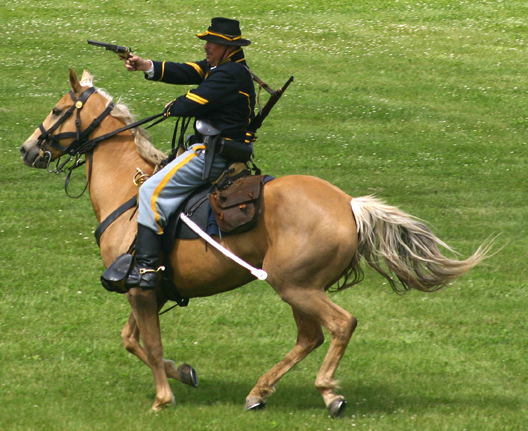 The Iowa 7th Cavalry consists of both mounted and dismounted troops. 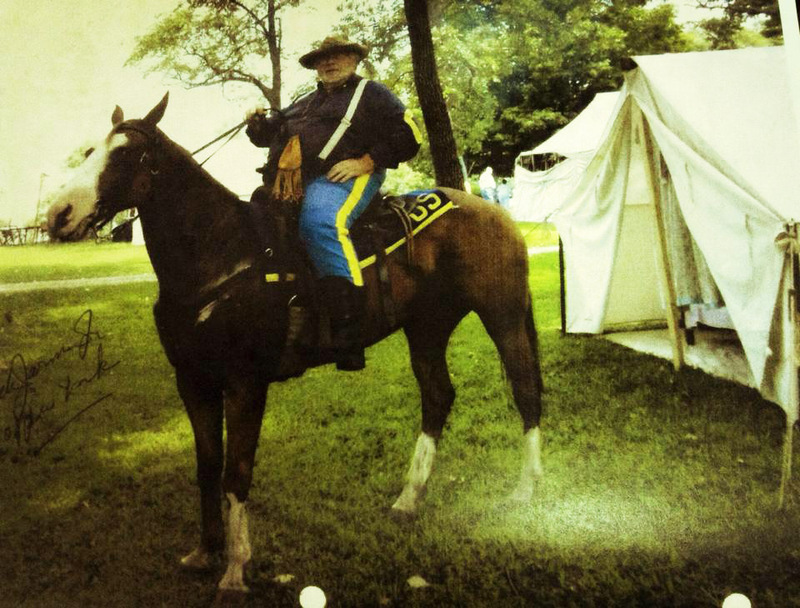 We are active in providing historical prepresentations of Civil War era cavalry to schools, nursing homes, and historiclal groups, as well as other organizations. We are proud to participate in the re-dedication of tombstones and memorials to Civil War veterans. 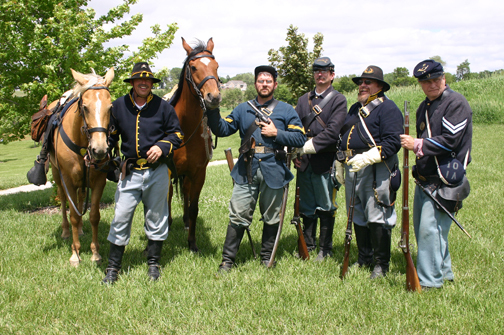 The 7th Cavalry also coordinated a Civil War reenactment at Twin Anchors Campgound in Colo, IA (click here for recent event photos). A major accomplishment was the coordination of the Marshalltown Soldiers Home reenactment. Click here for a write-up of the event. Go to the photoalbum for pictures (located on left column on main page). 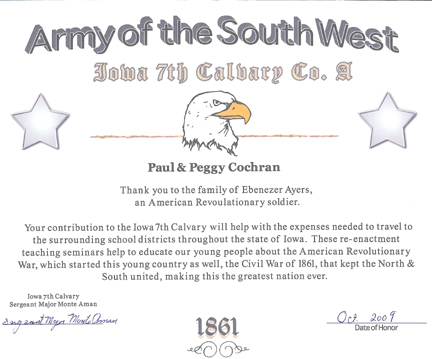 If you are interested in the history of this great nation, and in particular, the Civil War era, you are welcome to join the Iowa 7th Cavalry, a unit of the Army of the Southwest (ASW). The ASW also has civilian re-enactors, union and confederate infantry and artillery. We also offer to Civil War enthusiasts the opportunity to join the Invalid Corps. The Invalid Corps is made up of people who cannot go to the battlefield, but still wish to promote American history through Civil War re-enactment. For more information on the 7th Cavalry and how to become a member contact: Sergeant Major Monte Aman at saddletramp94362003@yahoo.com or call: 641-691-1123. Or, write to him at: 208 North Center St., Marshalltown, IA 50158. Below is a short history of the Iowa 7th Cavalry. For the longer, detailed version download this pdf file - 7th Iowa Cavalry History. For a complete roster of the regiment by soldier name, company, age, home, birthplace, and short annotation of his career click here. Certificate of support from Sergeant Major Monte Aman and Monte's recent activities in 2013, plus new horse JimBoy (click here). Efforts had long been made by Samuel W. Summers and H. E. Heath to organize a regiment of cavalry tobe known as the Seventh. Finally on the 27th of April, 1863, two companies were mustered in, on the 28th two, on the 29th two more, on the 3d of June and the 13th of July one. Three companies raised for the Forty-first Infantry and a company of Sioux City Cavalry were, by order of the War Department, now transferred to the Seventh. These latter companies had for some time been in service on the frontier. The regiment was now complete and the following officers were assigned to it: Colonel Samuel W. Summers, Lieutenant-Colonel John Pattee, Majors H. H. Heath, G. W. O'Brien and John S. Wood. The adjutant was Eugene S. Sheffield. Six companies were sent to Omaha under Major Heath and stationed in different parts of the Territory. In September Colonel Summers moved from Davenport with the remainder of the regiment and made Omaha his headquarters. During the entire term of service the various companies of the regiment were scattered over a wide extent of country where they were employed in active duties, protecting the frontier from hostile Indians. They garrisoned posts, escorted trains, protected emigrants, guarded lines of travel and telegraph and had frequent engagements with hostile bands of Indians. Portions of the regiment were engaged in many battles including White Stone Hill, Little Blue, Julesburg, Rush Creek, Mud Springs, Horse Creek, in some of which losses were sustained. They did good service over a wide range of country in Nebraska, Kansas, Dakota and Colorado under Generals McKean, Mitchell, Curtis and Heath. Their greatest loss was at Julesburg on the 7th of January, 1865, where Captain O 'Brien with Company F was escorting a train. The Indians in large numbers made an attack upon the train which was kept up during the entire day. Colonel Summers was with the company and directed the fight. At one time he was besieged on a ranch while Captain O'Brien brought up artillery and opened upon the Indians, who were finally driven off with heavy loss. Colonel Summers shot one of the chiefs with his revolver and fifty-five warriors were killed during the fight. Captain William D. Fouts and twelve men were killed during the year in other engagements. Colonel Summers was mustered out of the service on the 31st of January, 1865. Heath was, in the following May, promoted to colonel and soon after was brevetted Brigadier-General. He was placed in command of a sub-district with headquarters at Fort Kearney and subdued the hostile Indians in that region who had long harassed the settlers and emigrants. Major O'Brien also became colonel of the regiment and was a brevet Brigadier-General. The regiment was finally mustered out of service at Leavenworth, Kansas, on the 17th of May, 1866.